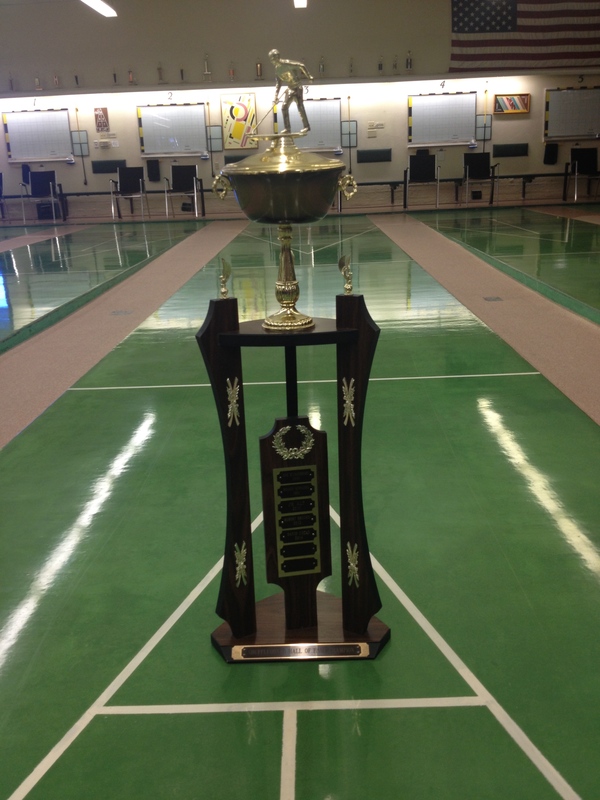 Obviously the Desert Challenge Trophy is a 10! 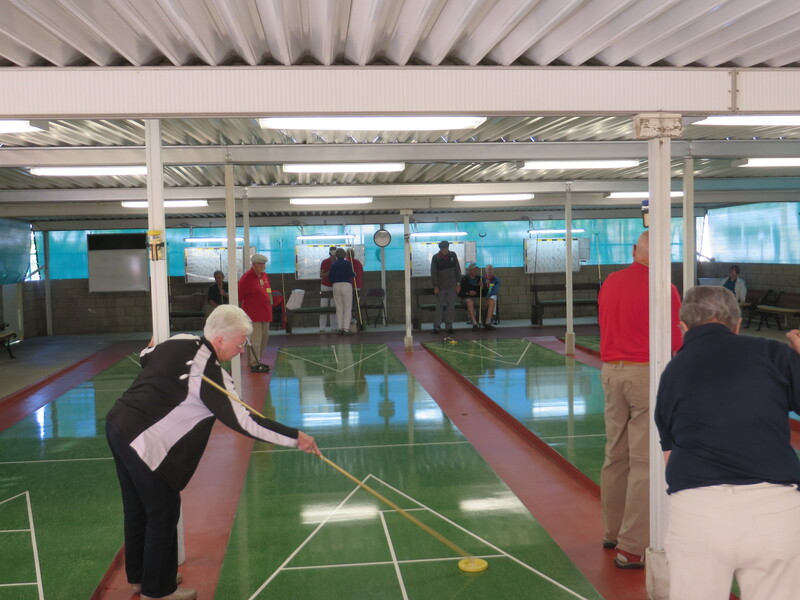 District 5 and District 7 are the 2 biggest districts in California.District 7 is often called the hub of California shuffleboard because it is the largest with just over 500 members. Most all of these players are full time residents of Hemet and Sun City. District 7 has 16 clubs and sadly is shrinking. 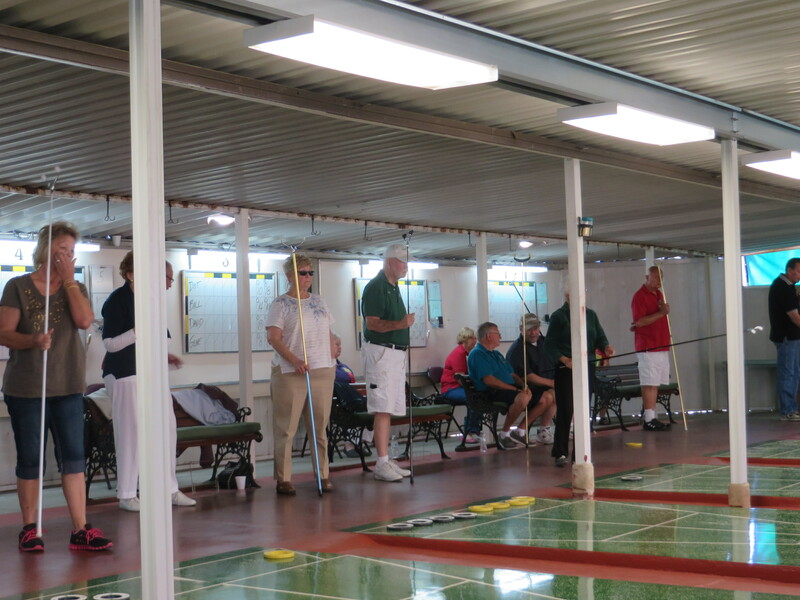 District 5, with almost 500 members has 11 clubs, spread out over the Coachella Valley, consisting mostly of snowbirds, that come to take advantage of all that the Palm Springs area has to offer during the winter months. 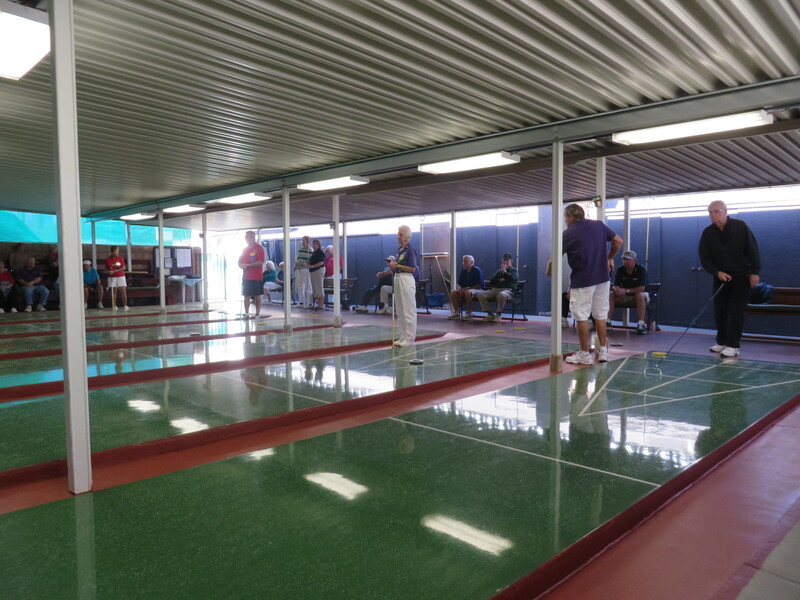 Last Saturday, the 24th, the annual “Desert Challenge” was held at the beautiful courts of The Royal Palms RV Park. Royal Palms is now a familiar name to shuffle boarders, but this one isn’t in Brooklyn, doesn’t have a bar, is outdoors, but is covered. 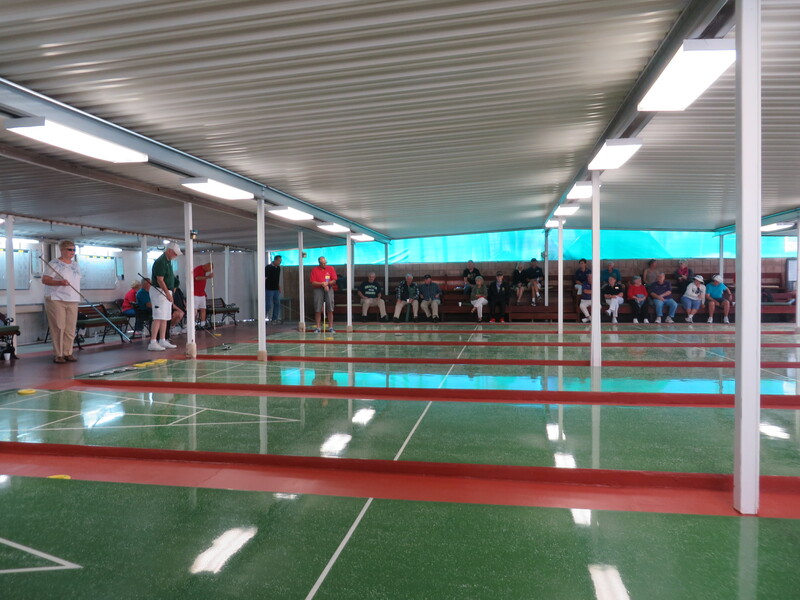 It is the largest club in the state, with 97 members. 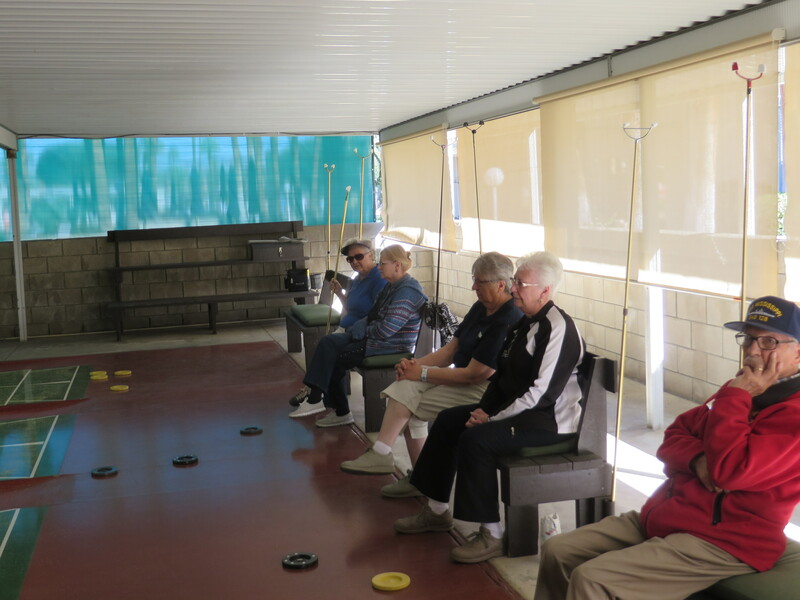 The club had enough volunteers to do all the score keeping, refereeing, and board maintenance. What a treat for all the players! Each District invited 40 players. The winter cold and flu season sidelined a few but replacements were found for most, allowing the games to start on time at 9:00am. The 10 courts are divided, 4 and 6. Pictures 1 and 2 are the 4 court side and 3,4 and 5, the 6 court side. After the early games, the score stood at District 7, 10pts, and District 5, 10pts. With the score being tied, the 1:00pm games were hard fought. With both sides ready to cheer, the announcement was made. 10pts to 10pts again! 20 to 20! The tie breaker was to be: 2 frames by 2 players, each getting a hammer. If needed, another 2 frames. If needed, each player would lag 1 disc and that would decide the winner. District 5’s Gene Eager, Indian Wells RV Park President, and District 7’s Jay Davidson (me), CSA President, were honored to be chosen for the playoff. Gene won the lag and chose yellow. I don’t know about Gene, but I was feeling the pressure. Lucky for me, the board seemed to favor the black side and I was able to score an 8 on my hammer. Gene’s hammer stopped just on the 8-10 line and District 7 claimed the Trophy. As the saying goes, a Great Time Was Had By All, and all are looking forward to next year when District 7 will host.